So its time for the first steps in remaking our kitchen. We have all of these really big plans but we are going to take it a few steps at a time. There are a couple of reasons for this, we want to make sure to have all of the cash, and we keep running into "little" problems that require us to make changes to the plan. Here is a messy before picture. We were trying to get rid of items and clean up before new appliances came. 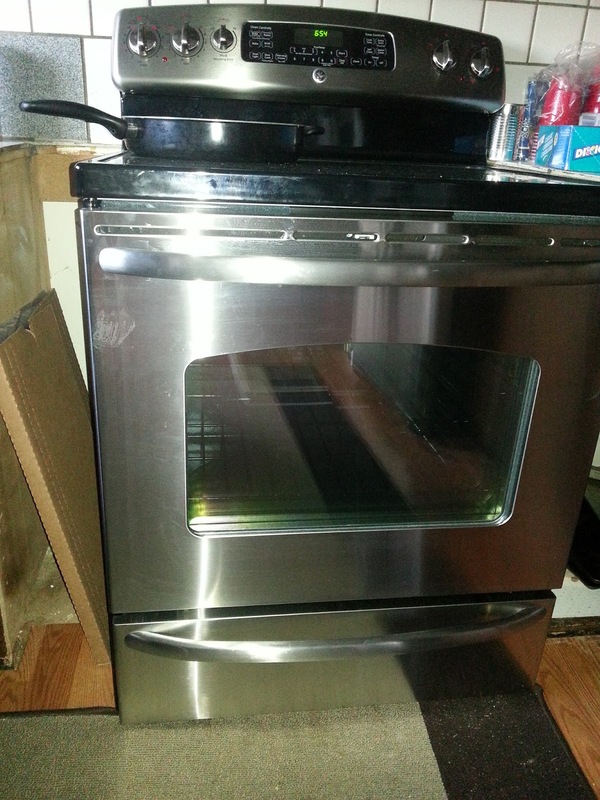 One thing we could not wait for though was appliances! Our appliances were of the "been collecting in our house since 1978." The fridge was a lovely white 1995 fridge that while adequate was not the prettiest piece of equipment ever. Our dishwasher was newer but had broken so many times it was hard to tell what was holding it together. Our electric stove was in good shape when we bought it because we were pretty sure it was hardly ever used. However with our constant use it had started to have lots of issues. 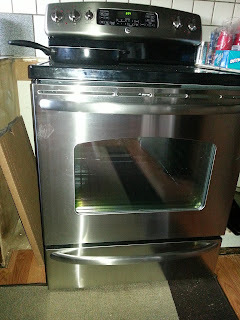 We had already replaced knobs and cosmetic things, the burners and the stove itself were starting to not work as well. So all in all it was time for an upgrade! To first start the remodel, we had to remove the cabinets above the old fridge. To do this, my husband unhooked and pushed out the fridge. To pull the cabinet down, we ran a razor blade around the seal. We also undid the screws holding it to the wall. 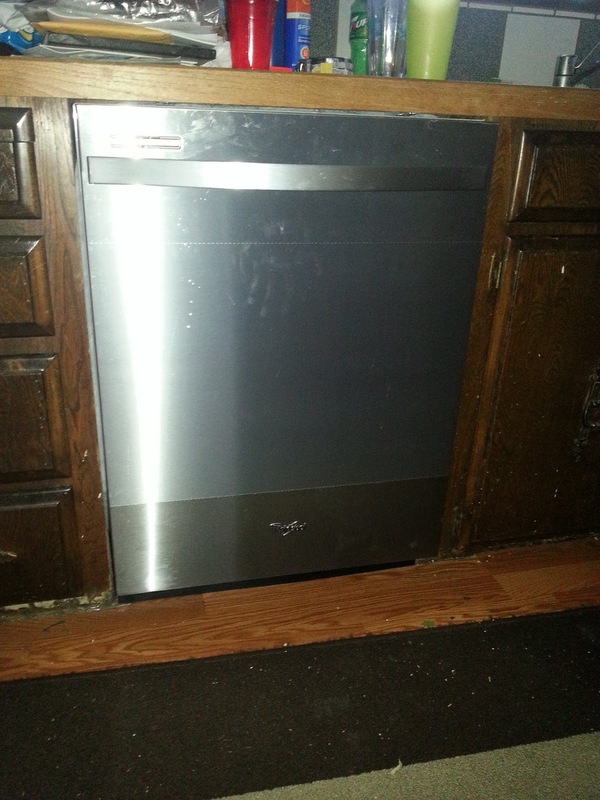 After getting the cabinets down we had to work through removing the stove and the dishwasher. The dishwasher was easy because we just had to unscrew and pull it out. It still meant a watery mess though! Pulling that old guy out! New stove ready to go in. Hubby working on getting water to the new stove. After the dishwasher was the hard part-the stove. We went from a drop-in stove to a freestanding stove. In the process we discovered that there were two pipes in the floor area under the stove connecting to the bathroom. This limits where we can place the stove in the fridge and also meant that we had to cut into the cabinets to place the stove in the meantime. Removing the drop in stove. Look at those pipes in the corner. This meant demolition time. Here is the old counter top that we found beneath the tile counter top. We still have some work that we need to do. Here are some pictures of the new appliances in action. The kitchen looks rough still but its a work in progress. We are leaving the plastic wrap on until we finish moving the fridge. New dishwasher with plastic wrap still on for moving. Our new stove with the large cap on the side due to the odd pipes. Oh well.